An automobile terminal will be constructed at the port of Mobile, USA, after the Alabama State Port Authority was awarded a Transportation Investment Generating Economic Recovery (TIGER) grant of USD 12.7 mln from the US Department of Transportation (DOT). The Port Authority has been elaborating on the plans to convert an abandoned bulk handling facility in the port’s upper harbor into a Ro-Ro terminal – the Southeast Automotive Gateway – for several years. Now with the grant allocated this March, the construction is expected to begin in September and to complete in late 2019. The terminal will handle finished automobiles, military vehicles, trucks, other rolling stock, and high and heavy cargo. Its annual capacity is assessed at 160,000 import and export vehicles. The Port Authority sees a clear need for this facility with several car makers that have built assembly plants in Alabama and surrounding states. Additionally, in February, Toyota and Mazda announced plans for a USD 1.6 bln assembly plant near Huntsville in north Alabama. 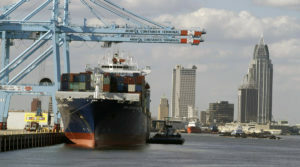 The port of Mobile is located in the south-east of the USA, at the north-central Gulf Coast on the Mobile River and handles containers, coal, wood products, grain, chemicals and other bulk, heavy lift and oversized cargo. Although Mobile is a newcomer to automotive traffic, it has an advantage with access to Class 1 railroads that connect the port with auto assembly ports in the region and with distribution hubs for import vehicles. The project’s cost is estimated at USD 60 mln. Apart from the TIGER grant, the Port Authority will use USD 18.5 mln of its own funds as well as USD 28.8 mln from the Alabama Gulf Coast Recovery Council, which is administering funds from the 2010 Deepwater Horizon oil spill. The new terminal will be developed in the form of a public-private partnership, through which the concessionaire operating the terminal will make capital contributions and cover operating expenses. Jimmy Lyons, the Alabama State Port Authority CEO, said that now the Port Authority will move quickly to seek engineering proposals while wrapping up paperwork with the DOT’s Maritime Administration in order to begin construction this autumn. TIGER grants for National Infrastructure Investments are highly competitive. Of the 41 projects included in the latest round for USD 500 mln of the grant, only 5 were for port-related facilities, and out of these only two (out of 40 port applications submitted) went to marine port authorities.